Tonight's dinner was made entirely possible by the kindness and generosity of the folks at Savenor's Market who donated the meat for this South African meal: Medallions of Ostrich with Port and Caramelized Black Currant Sauce. After a fairly extensive search, I decided on this ostrich recipe, accompanied by butternut squash (a staple in the country) and a salad of mixed greens, from my local organic farm, Hopestill Farm. I hope I've captured the country's rich culinary traditions, but if you're of South African descent and have other suggestions, I'd love to hear from you! Now, for an appreciative word and big shout out to my friends Julianna (the GM), and the awesome Butchers at Savenor's. First, if you haven't been to Savenor's Market in Cambridge or Boston, you're missing a true culinary experience. This little market is packed with every possible kind of exotic meat, interesting cheese, wild mushrooms, produce, hard to find spices and so much more. The staff is both knowledgeable and helpful, and if I hadn't had to go back to work this afternoon, I would have stayed the whole day. Bummer how work's always messing with my personal agenda. Honorable mention goes out to Leo, the "Wine Guy" at Trader Joe's in Framingham, who hooked me up with a lovely, very reasonably priced bottle of 2009 Goats Do Roam South African red for the sauce and a little sippin'. Thanks so much for your expertise and interest! 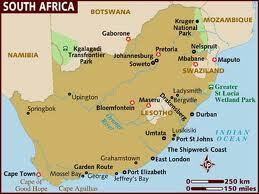 Slightly less than twice the size of Texas, South Africa is located on the southern tip of the African continent. This beautiful country sits on the coastline of the Atlantic and Indian Oceans. It's neighbors include Namibia, Botswana, Zimbabwe, Mozambique, Swaziland, and Lesotho, an enclave surrounded by South African territory. This culturally diverse is both ethnically and historically complex and country boasts 11 officially recognized languages. Slightly less than 80% of the country's population is of Black ancestry and the largest community of European, Asian and racially mixed citizens make up the balance. Cuisine in South Africa has many cultural influences. Tortoise, crayfish, mussels, dried and salted meat, bush meat, ostrich, coconuts, squash and dried fruit and fruit paste are all locally produced and eaten. Thanks to the the country's mild climate, potatoes, cabbage, corn, sunflower, peppers and green beans are available. On the northern tip that generally gets more rain, bananas, pineapples and mangoes grow in abundance. In addition to indigenous cooking, Dutch and British traditions can also be found in the form of meat and chicken pies. Pour the wine into a saucepan and bring to a boil over medium heat. Stir in the cranberry jelly. reduce heat and simmer until caramelized. Add the port, reduce again until the sauce is quite thick. Add green peppercorns and cream and let it reduce for a few minutes. Cut streaks into two portions and coat them with black peppercorns, then brush with oil on one side. Heat the oil in a pan over medium to high heat, when hot, place steaks, oil side down, into pan. Brush the top of the steaks with oil and cook steaks quickly for 2 minutes per side. Serve with butternut squash garnished with roasted pumpkin seeds and a green salad. Final Assessment: Well, my husband stated that ostrich would forever be his "birthday" meal of choice. The meat is lean, tender and has the texture of a really good cut of beef, without all the fat. 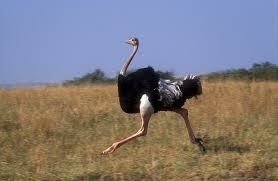 We all agreed that ostrich has a milder flavor than beef. I seared it in a very hot pan for about 2 minutes on each side because we like out meat rare. The peppercorn crust and currant sauce was both sweet and spicy in the best possible way. I'm forever a fan. Yum! I've never had kangaroo, but I'm game :) (Get it? Game? lol) - Thanks for stopping in Mr. Werther!